Looking for an inexpensive backyard office or a small cabin in the woods? Check out the growing field of container architecture, which offers container homes constructed from reused shipping containers. Builders today offer prefab container homes; there are also plans and kits that allow you to customize a container house. A large house built from shipping containers ranges in price from $150, 000 to $175, 000, about half the price per square foot of a conventional home. Dimensions for a standard size Intermodal Steel Building Unit (ISBU) are 40-by-8-by-8 feet; 20-foot containers also are available. 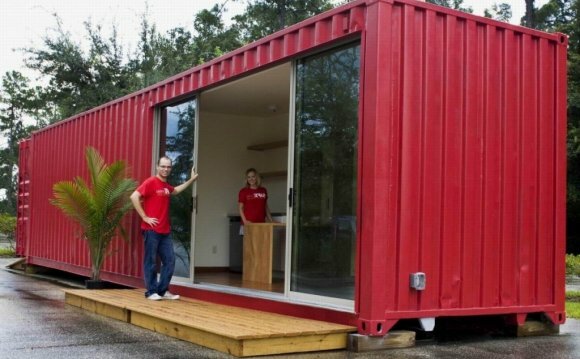 Steel containers typically cost from $1, 400 to $4, 000, and customizing a container home with electricity, plumbing, windows and other options can cost from $50 to $150 per hour. Anyone considering a container home also should take into account the cost of the land and a foundation upon which the container will be placed. Steel shipping container homes, also called storage container homes, offer a fast, green, and sustainable approach to building. These intermodal steel building units (ISBUs) are manufactured in a factory-controlled environment so they are standardized and reliable. They can be used to build an average-sized home with almost no wood. In North Charleston, SC, Tampa Armature Works (TAW) and local contractors quickly and easily constructed a container house, blending it perfectly into the surrounding neighborhood. They used four 40′ x 8′ x 8′ ISBUs laid side-by-side to create a three-bedroom, 1, 280-square-foot home without a hint of its original corrugated-steel exterior. When building with ISBUs, the building blocks are readymade and ready to transport. TAW starts by shipping the containers to their Tampa factory for modifications. Once there, the house blueprints are reviewed and each unit is custom-fit for construction. In a home where four containers are to sit side by side, all but the outermost side panels are removed so that, once connected, the ISBUs create an open 40′ x 32′ interior space. The vertical steel support beams are left in place for load-bearing purposes, with five along each remaining side of a container. Openings are cut into the outer walls for doors and windows. A shipping container house sits on a traditional concrete block foundation. A 40′ x 32′ stem wall foundation is set and reinforced with steel rebar. Concrete then fills the cells and 1/2″-thick steel plates are embedded into the concrete at the corners to secure the incoming ISBUs. Each plate sports a J-hook, which connects the shipping container to the exposed rebar and ties it all the way down to the footing. Additional footings are poured and individual concrete blocks are placed inside the foundation to support the sides of adjoining ISBUs. When the ISBUs arrive on site, they are crane-lifted one by one onto the foundation, hooked into place, and welded down to marry them completely to the foundation. These heavy-gauge steel shipping containers are so strong—each is designed to carry 57, 000 pounds—that they need only be fastened at the corners to hold fast, much as they would be on a ship. Attaching them to embedded steel reinforcements and welding them in place ensures they will be immovable. Once secured, adjacent units are welded to each other above and below. “Once they’re all welded together at top and bottom, ” explains structural engineer Steve Armstrong, “you have, in effect, a big steel box.” The result is a single, immensely strong structure that goes up in almost no time at all. A conventional hip roof can be placed and secured atop the “big steel box” structure in a matter of two or three hours. A trussed roof is fastened with metal straps that are welded to the steel sides and wrapped around the rafters at four-foot intervals. Simpson hurricane clips tie each individual rafter to the steel roof for added security and protection against uplift. Inside, workers install a 1/2″ plywood floor over the existing 3/4″ plywood subfloor. The crew runs metal hat channels for wiring along the walls and vertical support beams that dot the interior. Metal studs and drywall are used for interior partition walls. Once insulated, the existing container walls are faced in drywall for finishing, transforming the ugly corrugated-steel interior and prepping them for paint or wallpaper.